Canadian focused Skyharbour holds an extensive portfolio of uranium and thorium exploration projects in Canada’s Athabasca Basin. Skyharbour Resources (TSXV:SYH,OTCQB:YHBF,FWB:SC1P) has announced its plans its upcoming summer/fall 2018 diamond drill program to commence shortly. 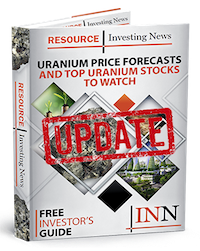 The company also reports that it has now completed the 100 percent earn-in of its flagship, high grade Moore uranium project well ahead of schedule. “We will be commencing our planned summer drill program very shortly to test more extensively new targets in the underlying basement rock at the Maverick corridor on the company’s flagship, high grade Moore Uranium Project. The known high grade, unconformity-hosted uranium mineralization at the Maverick corridor was deposited there through feeder zones in the basement rock, the discovery of which will be a top priority in this upcoming program given other recent basement-hosted discoveries including NexGen’s Arrow Deposit, Fission’s Triple R deposit and Denison’s Gryphon deposit. Furthermore, warrants that were set to expire have been exercised bringing in additional funds which have been used to complete the 100 percent earn-in of the company’s Moore project well ahead of schedule,” said Jordan Trimble, President and CEO of Skyharbour Resources.